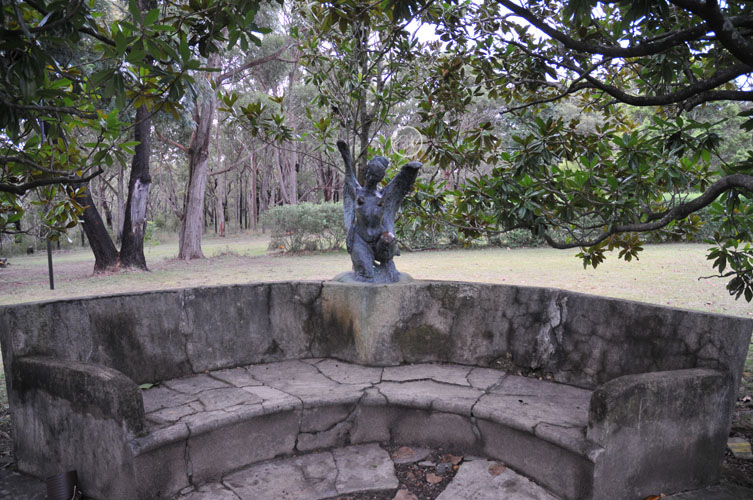 Norman Lindsay Sculpture Untiled c1920’s, just to sit and soak up the ambience, to immerse your self back in time and wonder how Norman must have enjoyed such peace of mind, frankly form this position it would seem ever so easy and defiantly inspirational. A bronze copy of this small work can be found on the back of the large concrete seat below the Bull Bay Magnolia’s. The original cement work is located under the loggia in the internal Roman courtyard. This sculpture was made in the mid 1920’s about the same time as the semi-circular concrete seat seen in some other shots. These works replaced a circular pergola or ‘roundhouse’, which was made by the previous owners. Sirens were a popular element in Norman’s work. Sirens date from classical myth and were believed to be part women and part bird and were supposed to lure mariners to destruction by their seductive singing. ‘Sirens’ was the title of the 1994 film starring Sam Neil, Hugh Grant, Tara Fitzgerald, Kate Fisher and Elle Macpherson, which was loosely based on Lindsay’s life at ‘Springwood‘ in the 1920’s. Nearly all the film was shot in the house and garden.